My kids love Bubble Guppies! My kids and their friends love Buuble Guppies. They are fun and educational too. My kids are obsessed with bubble guppies! I like that it teaches them a lot of information, the music is great and it has some silly comedy! My kids love this so, and so do I. It's educational without being in your face about it, and the characters are adorable. The songs are super catchy, and the animation is super cute. I even find myself watching this after my kids are in bed! Ive watched this show,its entertaining and a learning show,ive watched it,and i know children will too. I let my 2 year old watch this show often, I like the fact that there are lessons involved with the show and is veered toward younger children. I try and only let my son watch shows that are at least semi educational and I feel like this show also encourages them to use their imagination too. 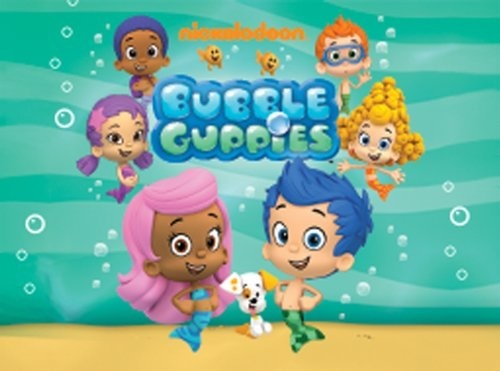 I love bubble guppies in general and so do my kids ( entertaining, educational, cute songs/characters) and it is probably more of a distribution mishap but I thought I would share that I got a Bubble Guppies " fun on the farm" DVD in the Bubble Guppies " puppy of the ring " case.